The burger who would be king? Lamb burger with harissa yogurt and zebra tomatoes, Provencal potato salad, confit of onion rings. In Mallorca and Haifa, in Mykonos and Ourzazate, summer is ending. Yachts are docked, discos are empty, Speedos are mothballed. No fancy, showy meals now--now we eat lamb, spiced with everything we've picked up on our journeys round the sea we've called, if only for a summer, home. Sirloin-ribeye-pork burgers with homemade aioli and heirloom tomatoes. First, to the farmer's market: a triumvirate of heirloom tomatoes in three colors. Then to the butcher. First he's reticent, recommending just sirloin. Pressed, he reveals further bits of butcher lore--the best burgers have three meats--sirloin, ribeye and pork. The Trinity. With the meat deftly but carefully weighed and neatly ground, Peter the butcher pauses--"These are going to be the best burgers you've ever eaten." 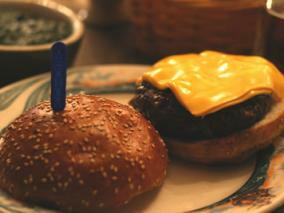 Homemade and home-ground beef burgers infused with blue cheese and served atop homemade buns.